A Coventry systems and software consultancy, which specialises in the automotive industry, has driven forward a record period of growth by expanding into larger offices. Embed, which develops automotive electronics and systems as well as embedded software, has effectively doubled the size of its premises at the University of Warwick Science Park in Millburn Hill Road after winning new business with a number of industry giants. The major expansion was brought about by the extra demand that meant the team had outgrown their previous space – and since moving into larger offices the company has continued to grow. The extra space has enabled the business – which works with several major firms including Jaguar Land Rover and Bentley – to install a new vehicle electronics integration laboratory which allows the team to work on vehicles and on bigger and more complex projects. Not only this, but six new staff have been added to the team including a systems engineer and embedded software developers, effectively increasing the company’s size by around 25 per cent making Embed 24 people strong. Company director Ivan Wilson hopes Embed, which was assisted in its growth by a £28,000 development grant through the Coventry and Warwickshire Local Enterprise Partnership through the European Regional Development Fund, will be powered up to break into new markets – including the rail sector. “We recently won a large research project with the Rail Safety Standards Board, and we are currently working on developing a new on-board computer for trains, we are bringing automotive technology to the rail industry,” he said. 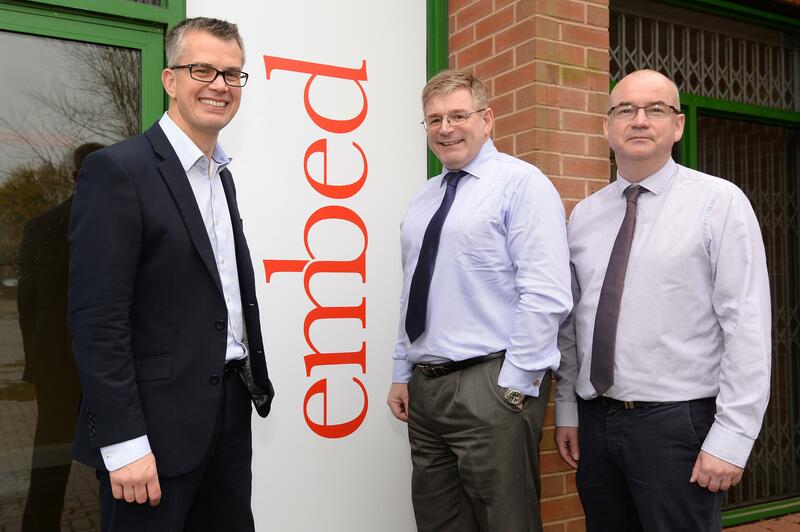 “This is a very exciting period for Embed, and the grant has helped our expansion into larger premises which has been a key milestone in terms of continuing the growth of the company. “As the automotive industry continues to move forward at a fast pace, the market is becoming more fluid, which is allowing smaller players, such as ourselves, to develop software for huge, market leading companies. Embed has been based in Coventry since it was established ten years ago when it was one of the first companies to use the Fast Start programme, a business support package for start-up and early stage companies run by the University of Warwick Science Park as part of the regional response to the collapse of MG Rover. Ivan added that its location at the Science Park has been a great advantage in supporting the firm’s growth as the company is now in its third location, each one offering Embed a different range of support facilities as the business has grown. “The Science Park has been a valued resource in terms of accommodating our growth as it happens.” he said. David Grindrod, director of the University of Warwick Science Park, said: “The University of Warwick Science Park is home to an array of businesses in the science and advanced technology fields. “These grants provide the perfect opportunity for local businesses to continue their growth by employing more staff, increasing output and utilising new equipment that has become available to them, ensuring they are on a firmer footing heading into the future. “Having seen the new premises we can already see the difference this grant has made and the positivity it has injected – particularly with the introduction of new engineers – which has provided a real boost to the company.